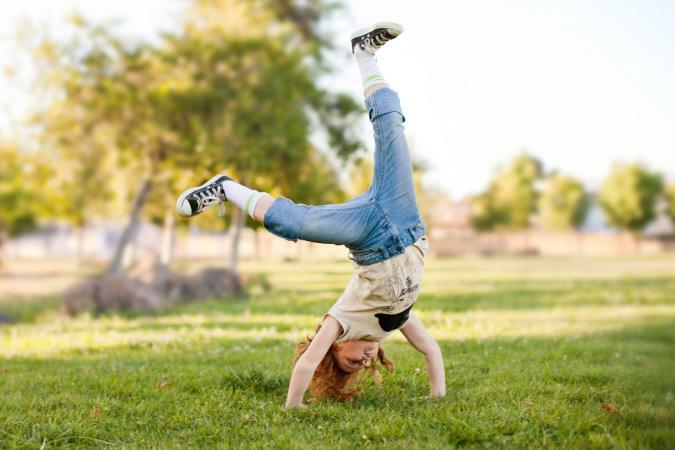 One of the best memories of childhood is doing cartwheels across the lawn. These printable coloring pages of kids doing cartwheels bring that wonderful memory to life. Print out these coloring pages so your child has something to do indoors on a rainy day. Then, when the sun is shining and the ground is dry, she can try out a few real-life cartwheels. These cartwheel coloring pages, which feature different children doing cartwheels, will keep your budding gymnast busy when she's not at gymnastics. To print these pages, click on the image below and a separate screen will open that you can print. If you have any problems, see the online guide to working with printables. The first printable is of a young girl in a gymnastics leotard. She is doing the different steps to a cartwheel. This sheet could be used for coloring fun as well as teaching the steps to do your own cartwheel. The next printable is of a young man right in the middle of a cartwheel with one hand off the ground and legs straight and apart. The third printable features a young girl showing the sequence of the cartwheel. Doing Cartwheels: This coloring page shows a young boy in the middle of a cartwheel. 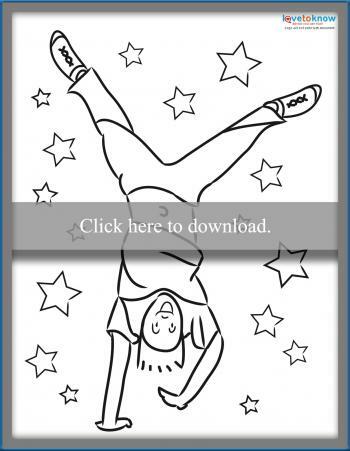 Girl Doing Cartwheel: This coloring page is of a young girl in the middle of a cartwheel. Cartwheel Directions: The last page in this coloring packet features a boy doing the different positions of the cartwheel and a little rhyme that will help your child learn. You can print only page 10 for the cartwheel page or use all the printables in the packet. Coloring pages make great summer decorations or you can use them for a variety of other fun projects for kids. Try these ideas out with your kids coloring pages. Summer rainy days can be a bore, but you can use the cartwheel coloring pages to make a fun summer activity book. Have the kids add a cartwheel page to their book, or they can create an instruction book for doing a cartwheel. Not only is the coloring fun, but making the book is creative. They could even make up a story about a kid doing a cartwheel. Using their cartwheel pages, kids can make a summer collage on a bulletin board. After coloring all the pages, cut them out and paste or pin them to the board. Kids might even choose to make trees and flowers to add to their collage. The perfect cartwheel is something that takes a lot of practice to achieve. Studying the positions in these printables and seeing how other people do cartwheels can help your child get started on the process. Don't stop with cartwheel coloring pages, try out other pages of the beach and 4th of July. You can also find other coloring page resources like kids coloring pages and printables.